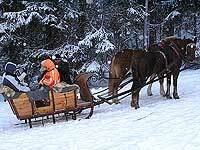 Active holiday can be spent in the High Tatras since ages. Beautiful nature and wild animals are good rasons for tourism. Ždiar can be a perfect place to get to know the charm of te High Tatras. Gelotourism, paragliding, original rafting down the rives Dunajec, riding the horse or an evening grillparty. There is a form of relax for every one. If there is a need for sunshine, there is a chance to visit the teral swimming pool in Vrbov or the Aquacity in Poprad. Ždiar an its close surrouding offer many opportunities for relax and sport. Ždiar is a popular ski centre for many years. There are about 20 ski lifts and a ropeway in the village. The closest ski lift is only 150 m distant from the Privat Cyprián. Ski-centre Strednica it 2,5 km distand and Ski Bachledova dolina - Jezersko 2 km. Take for granted, Ski- , sledge- and snow scouter rent and free ski- buses. Cross-country skiing lovers can enjoy a rout down the village along wood. 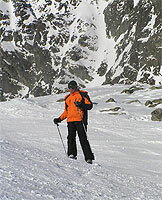 Switable conditions for skialpinism and demandig ski slopes can be found at the Skalnaté pleso. The village Ždiar belongs to the most imortant cultural and natural treasures in Slovakia. Typical "Goral" architecture can be admired here up to now. In the village there are more than 100 original log cabins. That´s why Ždiar was decalerd a folk architecture reserve. More information about our ancestors´ life can be gained in the musem Ždiarsky dom. Goralské slávnosti - the festival of folkore takes place in Ždiar every year in August (usually on the 2nd Sunday). Not only Slovak folklore gorups, but also some Polisch groups are invited. Dispite some diffeecies in cosums ther are some common features: dancing, singing, hospitality and love for nature.